With the expansion of smartphone, comes a small but powerful wearable device called smartwatch. One common limitation of smartwatch is the functionality of a tiny screen. Ph. 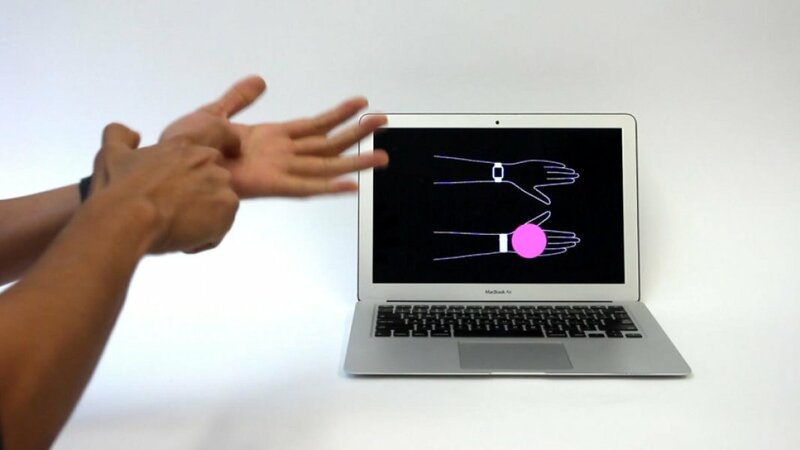 D. students, Gierad Laput and Robert Xiao, at Carnegie Mellon University have overcome this limitation by turning the skin on the entire arm as an extension of the smartwatch interface. The technology is called ‘ViBand’ consists of a special ring that produces electrical signal that is sensed by the band’s electrodes, detecting the location of the ring as you move. It is designed for continuous tracking such as recognizing gestures making your skin as a canvas. A smartwatch accelerometer is set to take measurements about 100 times a second to detect the motion done by the watch as it moves. The research team developed a custom kernel or the Viband’s operating system that enables the sampling rate increased up to 4 kHz. The result shows wide range of applications such as using bio-acoustic signals to detect hand motions and device motion tracking. The smartwatch can also sense the vibrations of motor-powered devices with context information providing the consumer visual feedback of the device. The system is still a prototype, the research team is sorting out how sweat, body motion, and hydration could alter the signal. According to the group, “As our approach is compact, non-invasive, low-cost and low powered, we envision the technology being integrated into future smart watches, supporting rich tough applications beyond the confines of the small touch screen. ”Want to know more about this awesome device? Follow this Link!